Synonyms: Byrsonima cubensis Juss., Malpighia crassifolia L.
Other names: Chachunga, golden spoon, savanna serrette. Nance is native to tropical America. 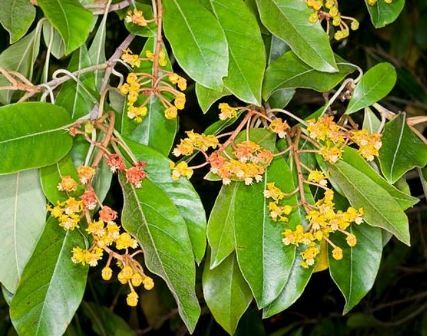 It is abundant in the wild from southern Mexico, through the Pacific side of Central America, to Peru and Brazil; also occurs in Trinidad, Barbados, Curacao, St. Martin, Dominica, Guadeloupe, Puerto Rico, Haiti, the Dominican Republic and throughout Cuba and the Isle of Pines. It was brought to USA by Dr. David Fairchild in 1899. This fruit has now also reached South East Asia. 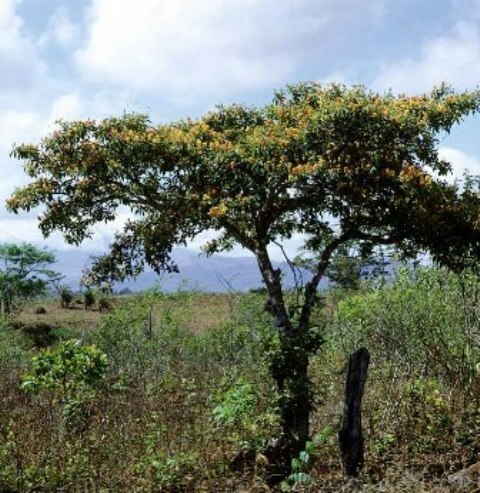 A slow-growing large shrub or tree upto 10 m tall, varying in form from round-topped and spreading, to narrow and compact; trunk short or tall, crooked or straight. Young branches densely coated with russet hairs. Leaves opposite, ovate to elliptic or oblong-elliptic, 3.2-17 cm long and 4-7 cm wide, rounded or pointed at the apex, blunt or pointed at the base; leathery, usually glossy on the upper surface and more or less brown- or grey-hairy on the underside. Flowers borne in thinly or conspicuously red-hairy, erect racemes, 10-20 cm long, 1.25-2 cm wide; petals 5, yellow at first, changing to dull orange-red. Fruit peculiarly odorous, orange-yellow, round, 8-12 cm wide, with thin skin and white, juicy, oily pulp varying in flavour from insipid to sweet, acid, or cheese-like. There is a single, fairly large stone, containing 1-3 white seeds. 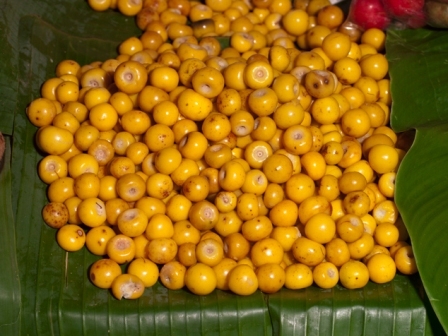 The fruits are eaten raw or cooked as dessert. In rural Panama, a popular dessert, pesada de nance, is prepared from nance fruits with the addition of sugar and flour. The fruits are also made into dulce de nance, a candy prepared with the fruit cooked in sugar and water. In Nicaragua (where the fruit is called nancite), it is a popular ingredient for several desserts, including raspados (mixed with ice). The fruits are also often used to prepare carbonated beverages, flavor mezcal-based liqueurs, or make an oily, acidic, fermented beverage known as chicha, the standard term applied to assorted beer-like drinks made of fruits or maize. Nance is used to distill a rum-like liquor called crema de nance in Costa Rica. Mexico produces a licor de nanche. 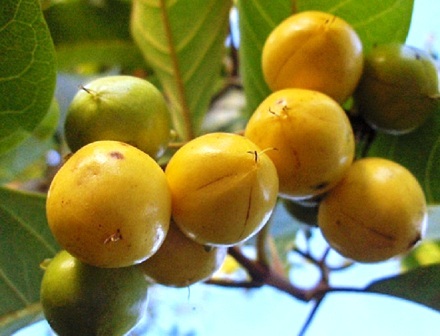 Nance can be grown at all the places with tropical to mild subtropical climate. Its trees are tolerant of a wide range of environments, from the coastal Caribbean, the semi-desert regions of northeastern Brazil, the humid tropical lowlands and the middle elevations (1,000 m) of central and south America. Nance trees are highly drought tolerant. Propagation is generally by seed, but the trees are easily grafted and in some locations superior clones are commercially propagated by veneer or cleft grafting.